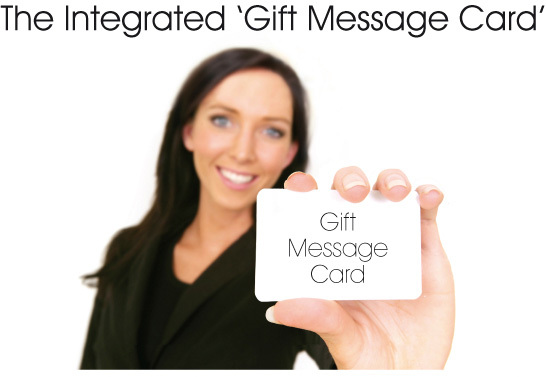 The integrated 'Gift Message Card' is without doubt one of our most innovative products and provides your business with a number of very important benefits. 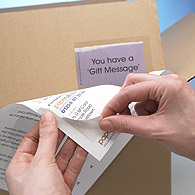 It’s unique design allows the card to be securely fastened to either the ‘Gift Box’ or the ‘Brown Outer Carrier Box’ and lie totally flat to the surface preventing it from being snagged or knocked off in transit. The Gift Message Card is protected from the elements and most importantly, the message remains totally private throughout. The step by step guide below shows how you can improve you operations, increase your sales and save your business time and money. What’s more, it is also suitable for Direct/Thermal Transfer application and can be supplied in a fanfolded pack if you prefer! 1. 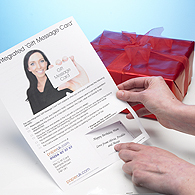 Personalise the Gift Message Card, Despatch Note and Address Label in just one operation. 2. 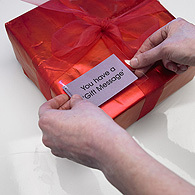 Push the Gift Message Card through from the front of the form. 3. Once removed, the card is ready to be attached by using the laminate surround. 4. The card is turned over and applied to the gift box. 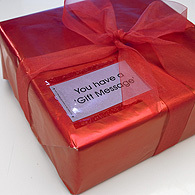 ‘You have a Gift Message’ is displayed. 5. 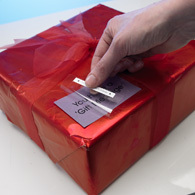 The card is fastened securely to the gift box and the message remains completely private. 6. 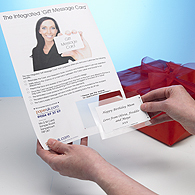 Peel back the laminate using the dry lift tab to release the Gift Message Card. 7. The card is released and the message is revealed. 8. Many retailers place the Gift Box into a brown outer box. The 'Gift Message Card' can be fastened to this box as well. It has been designed specifically to sit flush to the outer surface eliminating the possibility of getting snagged or knocked off in transit. 9. 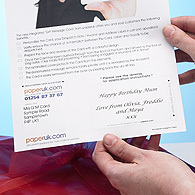 The laminate protects the card from the elements and the message remains completely private. 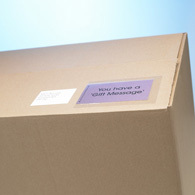 The address label can be applied at the same time eliminating the risk of a mismatch. Brilliant!